Neither. Both. They’re both entirely generic in completely different ways. Pick your poison with our spoiler-free first impressions of their pilots. Time After Time is an ABC show based on a 1979 movie about author H.G. Wells using a time machine he built to chase his friend, Jack the Ripper, into the present day. Frequency is a CW series based on a 2000 movie about a cop who uses a ham radio to talk to his deceased father in the past. He saves his dad’s life, but that somehow results in a serial killer on the loose, so father and son work together across time to find the killer. The Time After Time remake stars That Dude From UnREAL (Freddie Stroma) as H.G. Wells opposite That Dude From Revenge (Josh Bowman) as Jack the Ripper. The premise is ridiculous, but the execution doesn’t quite lean into it as much as it needs to in order for this to be a guilty pleasure. 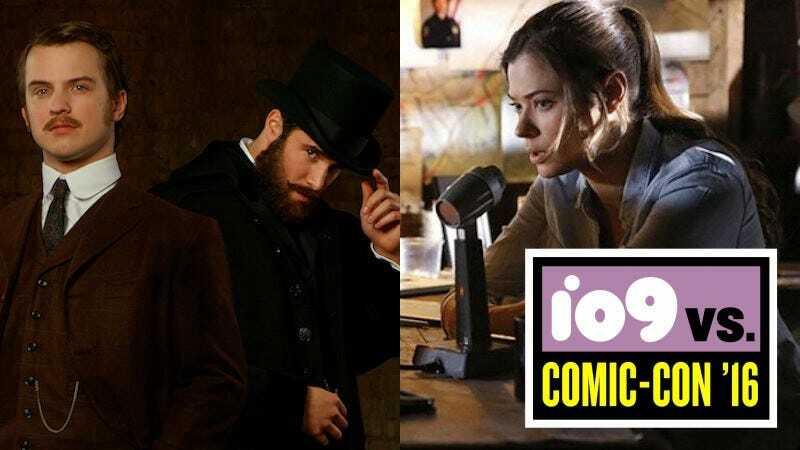 Although Bowman’s Jack is trying his absolute best to chew the scenery, Wells and the assistant curator who is clearly his love interest/partner (Genesis Rodriguez) don’t have enough chemistry to power the plot. Also, she sounds like she was written by an old man who’d never heard a young person speak before. It’s far less interesting than anything with a plot about a time-traveling H.G. Wells and Jack the Ripper has any business being. But the cast is pretty to look at. Frequency’s pilot makes it hard to get a read on it, since the pilot is pretty much the same as the beginning of the original movie. A few minor plot things have been changed to be more exciting including the fact that the main character is no longer Jim Caviezel and is now Peyton List. The gender swap is kind of perfect because it changes nothing about the plot. On the other hand, Frequency likely isn’t interesting enough to hold your interest. Maybe as the series gets going and we see more effects of mucking about in time, things’ll pick up. But for now, the most interesting part of the show was how editing was used to show the divergent timelines. Of the two, Frequency is more polished and has more potential to be actually good. Time After Time feels like it needs to loosen up and get campy to be worth a watch.